The stability of foods and assessment of the shelf-life of foods are major issues for the entire food and drink industry. Companies are experiencing considerable difficulties in defining and understanding the factors that influence stability over the desired storage period. 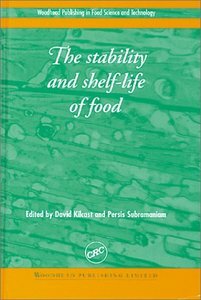 The Stability and Shelf-Life of Food discusses the tools that can be used to measure shelf-life, what determines shelf-life and the ways it can be extended. It concludes with chapters on the shelf-life of specific foods, including fruits and vegetables, baked foods, dairy products, oils, and fats. Edited by the head of sensory science at an internationally-renowned center for sensory and shelf-life analysis, the collection brings together a range of European and US experts to assess such issues as the use of sensory, instrumental, and accelerated tests to measure shelf-life, the complex range of factors which determine the stability of food, and how these can be used to extend the shelf-life of particular products.